TOUCH OF CREATION: Happy Sunday!!!! Lovely cards Piali. I love how you use pattern paper. What a WONDERFUL card! 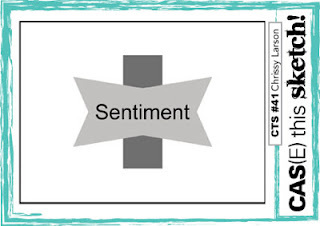 I love how you used horizontal lines, diagonal lines, circles and rectanges and it all works! Thanks for playing along with us at the Drunken Stampers Lounge! Both are fantastic!! Love your style! 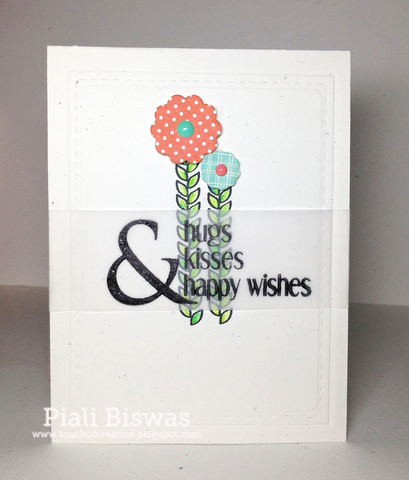 Gorgeous cards Piali! Love how the twine matches the patterned paper on the first, and how you stamped the sentiment on vellum for the second card! Thanks for playing along with the Drunken Stampers Twine challenge! These are gorgeous, Piali! I love the different coloured twines on your classy first card, and such a pretty take on the CTS sketch for the second. Thanks for joining us at Drunken Stampers this week! Those twines tied together really set off your card! I love the way that they lay over the striped paper. Thanks for joining us at Drunken Stampers! Wonderful take on the sketch with the vellum overlay--so clever! 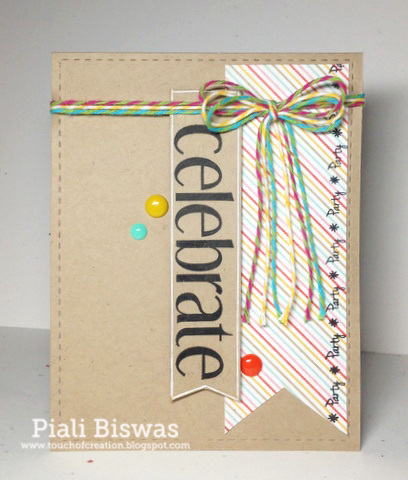 Love your layered sentiment over the beanstalks, Piali! The celebrate card is so darn fun, too. So glad to see you at CAS-ual Fridays challenge! Lovely cards, I so envy anyone that cam make a truly CAS card. Great stitching on the first card, and the way you used the Thing/twine/string thanks for playing along with the Drunken Stampers for the challenge. Great cards!!! Thanks for playing along with the Drunken Stampers this week for the twine challenge! I love both of these, Piali! The enamel dots & bright colours pop on the kraft, and I love that multi-twine bow. I love the sentiment on the second - and the vellum. Gorgeous!! Beautiful CAS cards!Thanks for joining us at The One Stop Craft CHallenge!